Provide comfort for the family of Mary Smoot-McAllister with a meaningful gesture of sympathy. Mary Smoot McAllister was born on June 8, 1929 in Florence County, SC to the late Charlie Smoot, Sr & Emma Wright Smoot, and stepdaughter of Emma E. Smoot, She departed this earthly life on Thursday December 20, 2018 at her residence. Mary was Educated in Florence County, SC public school system. Mary was employed with a laundry services and was a homemaker. Mary was longtime and faithful member of the Mt. Rona Baptist Church, Effingham, SC where she was awarded the Mother of the church on July 8, 2018. Mary Hobbies were singing and gardening. Her favorite saying was, everyone has ring around the collar and I won’t complain, and I Need A Little More Jesus. Mary was united in marriage to the late Ned Mcbride McAllister to this union five children was born. She was preceded in death by her Husband: Ned McBride McAllister, her parents, three daughters Peggy Lee, Carolyn Jackson Graham, Martha Ann McAllister Briggs; one son Ned McAllister, Jr. Four brothers; Moses P. Smoot, Franklin Smoot, Charlie Smoot, Jr, Edward “Buddy “ Smoot, two sisters Louise Smoot Swinney, Emma Smoot, step-sister Annie L Keith. 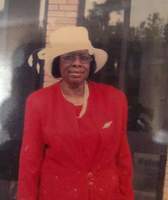 She leaves to cherish her loving memories: her daughter Brenda ( Willie ) Green of the home, two sisters Ida Mae Smoot Davis and Vermell Smoot (Robert) Hendriex, Jr. both of Florence, SC a special daughter: Rosetta ( Manning) Joe, a special son Samuel Davis, one son in law John Graham two sisters in-laws; Margarie Smoot and Annette B. Smoot, one brother in-law Boykin Swinney Jr, a host of grandchildren; and a host of great -grandchildren; a host of nieces, nephews and other relatives and friends. To send flowers in memory of Mary Smoot-McAllister , please visit our Heartfelt Sympathies Store.